OST to Outlook Software is a leading OST email conversion tool which is an able to convert OST file to Outlook. By using this tool you can fix OST errors and recover all emails with attachments, calendar, contacts, tasks, notes, journals and so on from unusable OST file. Get maximum benefit of OST to MS Outlook conversion software is perfectly planned to recover data from corrupt OST file and save them into PST file as an output. 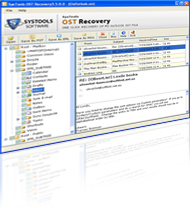 OST to Outlook converter tool is well-known software for its performance worldwide. Most of the time OST files become orphaned, when exchange server connection breaks with MS Outlook due to following reasons: - Virus Attack, Suddenly Shut Down, Synchronizing Error, Exchange Server Crash, Database Corruption, Software and Hardware Failure, Exchange User Account Deletion etc. And at this notion! Users search these types of queries for solving problems such as: - How to Convert OST to MS Outlook? or How to Open Orphaned OST File? Exchange OST to MS Outlook Software is becoming a leader in the field of OST conversion. This Unbeatable OST to Outlook converter tool always keeps the best and informative conversion results in comparison of other conversion software. Now, utilize one of the finest OST converter application that has been designed with advance and latest techniques to convert OST to MS Outlook 2016/2013/2010/2007/2003 and Its uncomplicated user graphic interface helps all users to convert OST to Outlook without any difficulty. By using Demo version software you can just view the recovered OST data (Emails, Calender, Contacts, Sent Items, Drafts etc) after complete convert OST file process, but you cannot save data in their machine (Desktop/Laptop). By using Full (License) version software of OST converter you can recover and save all OST data in PST file. Software will allow 3 options to save recovered data into PST, MSG and EML file format. Online Support center provides assistance to users. We are here to help you do solve your OST to MS Outlook related queries! "I am very happy with your Advance Software, in my opinion; your product is terrific because my exchange server got crashed but this intelligent software has helped me to access back my OST data in a few moments."